The Miami cruise ship port is always an exciting place to visit as it marks the stopping off point for Miami departures of round trip cruises headed to the Caribbean or the Bahamas. 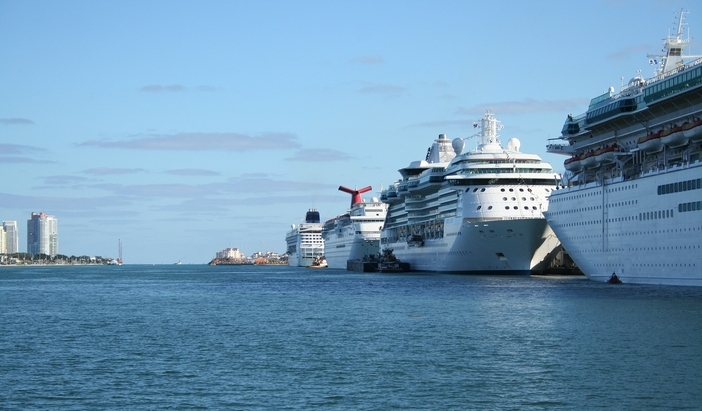 Many cruise-goers like the 3 night Bahamas cruises that are offered by cruise lines as they can get away almost any time and work the departure schedule into their own work routine. The Miami terminal, which has just been newly renovated, is home to seven main terminals, three of which are popular areas for setting sail on cruise ship vacations. For example, terminals D & E are comprised of 105,000 square feet. This section of the Miami cruise ship port is designed to accommodate cruise-goers who are sailing on vessels carrying as many as 5,000 passengers. Each terminal features high-tech security, VIP lounge, and a conveyor type baggage system. Terminal J at the cruise port plays host to travelers who are setting sail on such cruise lines as Crystal Cruises and Oceania Cruises. The terminal, which recently underwent a renovation costing $3 million, highlights extra lounge seating, remodeled restrooms, new check-in counters and the latest furnishings. Passengers can rest their eyes on the exotic green landscaping that is showcased in the facility’s atrium.